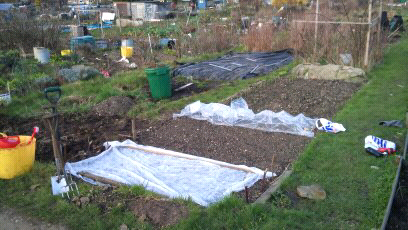 Another afternoon spent digging couch grass out of the bed, though I now have a fully dug bed warming up under black polythene, waiting for beans later on. The garlic is growing well and the onions seem ok but they haven't really done too much. 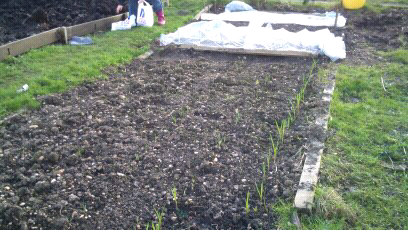 The leeks and parsnips which went in a fortnight ago haven't shown at all yet so I hope they didn't go in too early. 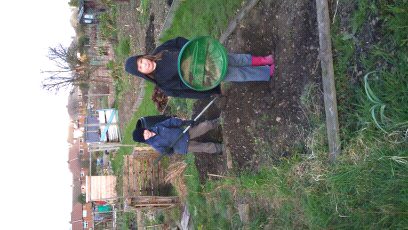 The cloche over the leeks is pretty crap, it's sagged with the rain, I need to buy some proper cloches from ebay. 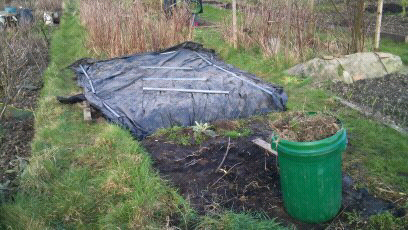 The parsnip seeds are now tucked up under some fleece. I am not an organic gardener. Roundup went on the remaining uncultivated bits at the top of the plot, including the path down the middle. This is my next bit to dig, hopefully starting on Friday unless I dig up the raspberries, much will depend on delivery of muck. Other people's plots are really well dug over. This is not good when mine is still 75% weedscape. What will the neighbours think? Tomatoes are germinating on the windowsill, no sign of chillis or broad beans yet. 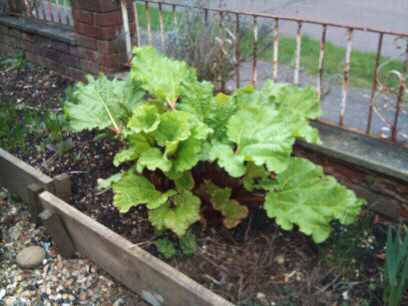 Rhubarb is doing really well. The kids enjoyed themselves digging holes today, they'll be gutted when their 'craters' need to be filled in with muck for planting pumpkins.